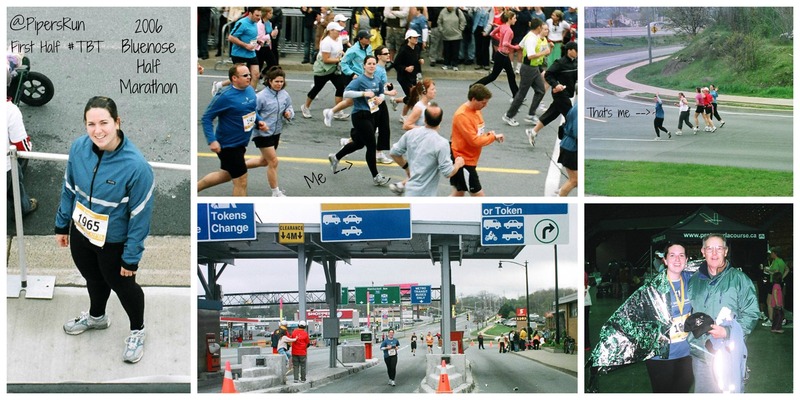 I thought it would be fun (for me) to look back at my first half marathon in 2006. I ran the Bluenose Marathon in Halifax, Nova Scotia. I think that’s when I think I really got bit by the running bug. I didn’t always want to run a half but after running a few 10k’s I thought it would be fun! Yes, FUN! So, I registered in January and starting my training for the May long weekend event. I was living in Ontario and would have to fly home – sounds good to me! So, I was training; cross-country skiing, snow shoeing and running. I met my (little did I know) future husband who also ran, skied, hiked, rock climbed etc. while working at the Outdoor Centre. I was surrounded by active people and a handful of runners. My training was all done on hills! Since I lived at the camp, you had to drive in the camp road which was rolling hills. Big hills, little hills and long stretches, not to mention a lot of wildlife. I trained as much as my schedule would allow and did a lot of my runs during “happy hour” 4:30-5:30. If it was a hot day I would jump in the lake before heading up to the dining hall for dinner. Life was pretty good! My longest run was 19k before the half and I remember running back along the camp road after 9:30pm thinking that I was crazy! Also, I was a little freaked out about the bears that I could potentially “meet” so I ran that last stretch pretty fast. I also remember some of my staff members were getting a little worried about me and were about to come find me. Going into the race my only plan was to run 10 minutes and walk one. As we lined up at the start area I remember thinking, I should probably find a pace bunny to stick with. So, I chose the 2 hour 30 minute bunny. I stuck with her until the 15k mark and then lost sight slowly. I also had my first GU and thought it was terrible – not so much anymore! We had to run up the steepest hill in Dartmouth called Maple Street. As I approached it I saw an ambulance with its doors open and the Paramedics were treating a runner. Needless to say, I was a little freaked out! At km 19k we crossed back over the bridge and to the finish area. Let’s just say I wasn’t too happy that I still had to run 2 more kilometers after that but somehow managed to do it. My Dad drove around the course to snap these shots of me and then met me at the finish. My mother was volunteering and gave me a blanket since I finished the half. The year before when I ran the 10k, she wouldn’t give me one since they were only for half and full marathoners – maybe that’s why I challenged myself to the half – just to get a space blanket from her 😉 The things parents do for their grown-up kids. After that race I changed my mind about half marathons. I figured I’d to another one someday but didn’t think it would take me this long to get back at it! This weekend I am super pumped, scared, excited, nervous, energized and happy to be running my 2nd half marathon. Thanks for reading my weekly recaps. Your comments have helped me learn and grow as a runner and person. Do you remember your first BIG race? Do your family members volunteer at your runs? Holy you are sure going to crush that time this weekend! Love that your dad followed taking pics, he’s awesome! Look at all those changes! This is going to be such an incredible half. Much more prepared and truly a runner. Have a blast! It’s going to be different, that’s for sure! I’m looking forward to the whole 21.1km 🙂 Funny, I feel more like a runner this time around. I love seeing where we come from and where we get to. Love this peek into your past. You are only set for bigger and better things. I hope your muscle is feeling better! That’s awesome! Isn’t it crazy to look back and see all that we’ve learned about running and racing? If we knew then, right? It IS crazy to look back and see what I’ve learned. I feel like I’ve learned more about running in the past year then I have in 10 years! It took me a while to like GU’s too! The longest I ran before my first half marathon was 11km, so to say it was a memorable one would be an understatement, ha ha. Oh, I bet that was an interesting run!!! You got this! I don’t think anyone is ever really ready for their first big race, I sure wasn’t. You’re training has been great and you will have a great race! Way to go! Do what you can. Get out and run or walk. Do what makes you happy.